Elma Water Technologies Canada – Amaircare Whole House HEPA Air Purifiers and Filtration systems. High Performance Air purification. "As usual, your team did a great job with the air purifier installation." Amaircare is our most popular line of whole-home HEPA air-purification systems. Amaircare build their own HEPA filters in house. HEPA (High Efficiency Particulate Air) is a filtration standard created by the U.S. Atomic Energy Commission. To pass this standard, a filter must be 99.97‰ efficient 0.3microns. Due to their extremely high efficiency, HEPA filters have become widely used in medical, electronic and industrial applications. That is why Amaircare developed the 'Perfect Seal HEPA'. The Perfect Seal HEPA ensures that air passing through the HEPA system, is filtered through the HEPA media and cannot escape around it. Each and every HEPA filter that Amaircare builds, is tested with a laser particle counter to ensure that it does indeed, meet or exceed HEPA standards. A Perfect Seal. 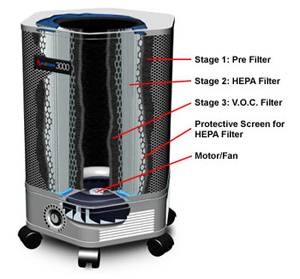 All Amaircare HEPA systems come standard with a 3 stage filtration process. A pre-filter to capture large particles such as dust, a HEPA filter which captures 99.97% of particles from .3 microns or larger, and a V.O.C. filter for removal of gasses and odours. All Amaircare® pre-filters are designed to prolong the life of the HEPA filter. This is done by capturing the visible dust and particulate from the air. This keeps the larger particles from clogging the HEPA filter so the HEPA can be used strictly for filtering the smaller particles that cannot be seen with the naked eye. Activated Carbon Pre-filters: Activated carbon is a form of charcoal which has the ability to remove impurities from air, gas, and liquids. When various impurities come into contact with the activated carbon, the constituent molecules become trapped in tiny capillary passages on the surface of the carbon in a process called adsorption. Due to differences in molecular structures, some impurities are more readily adsorbed than others. Foam Pre-filters: To make the pre-filters last longer, Amaircare® has introduced a foam pre- filter to some of their filtration systems. This foam filter is washable, which drastically increases it's life. The filter can be removed, washed, and placed back onto the unit (when dry). The filter is useable until it becomes stretched out of shape and no longer fits the unit properly. This foam pre-filter does not contain Activated Carbon. HEPA is a filtration standard created by the U.S. Atomic Energy Commission. HEPA filter media is proven to be 99.97‰ efficient @ 0.3 microns (a micron is 1/1,000,000 of a metre or 1/25,000th of an inch). Due to their extremely high efficiency, HEPA filters have become widely used in medical, electronic and industrial applications. HEPA filters are composed of a various sized borosilicate fibers, which are pressed together to form a netlike structure with openings large enough for air to pass through but too small for most particulates. Americair manufactures its own Amaircare® brand HEPA filters. The filter media comes off a roll and is pleated for optimum surface area. Filament is bonded to the filter to provide structural support and even pleat spacing. After the pleating process, the filters are enclosed in protective screens and cast in food-grade plastisol at both ends for a 100% air seal. Each finished filter is tested for 99.97% efficiency, with a laser particle counter. Carbon V.O.C. Blankets: Like the Carbon Pre-filters, the Carbon Inner Blanket is a form of charcoal which has the ability to remove impurities from air, gas, and liquids. When various impurities come into contact with the activated carbon, the constituent molecules become trapped in tiny capillary passages on the surface of the carbon in a process called adsorption. Due to differences in molecular structures, some impurities are more readily adsorbed than others. Carbon/Zeolite V.O.C. Cartridges: V.O.C. cartridges capture contaminants the same way as a Carbon Blanket, but they use solid carbon and zeolite pellets which have a comparably larger surface area. This makes V.O.C. cartridges the filter of choice for situations where V.O.C. removal is a prime objective. 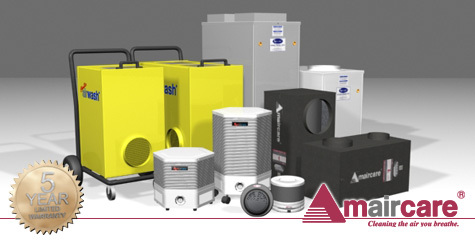 The housings for Amaircare® air filtration systems are made of durable metal, not plastic, which can be a source of V.O.C. 's.